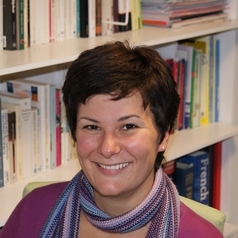 Dr Charlotte Baker is Senior Lecturer in French and Francophone Studies in the Department of Languages and Cultures. She holds a BA in French and English Literature from Lancaster University, and an MA and PhD in Francophone Literatures from Nottingham University. Charlotte's research focuses on Francophone and Anglophone African literature, questions of disability, marginality and human rights, and the role of the arts in bringing about social change. Charlotte is particularly interested in the genetic condition albinism, and has published widely in this field. She was awarded a Knowledge Exchange Fellowship and Wellcome Trust funding for the Albinism in Africa project, which she set up in 2014. She is also writing a monograph examining the critical engagement of post-independence Francophone West African writers with dictatorship and editing a special issue of Research in African Literatures on this subject, forthcoming in Summer 2018. Charlotte is Associate Dean for Postgraduate Studies for the Faculty of Arts and Social Sciences at Lancaster University, President of the Society for Francophone Postcolonial Studies, and General Editor of the Liverpool University Press Francophone Postcolonial Studies series.